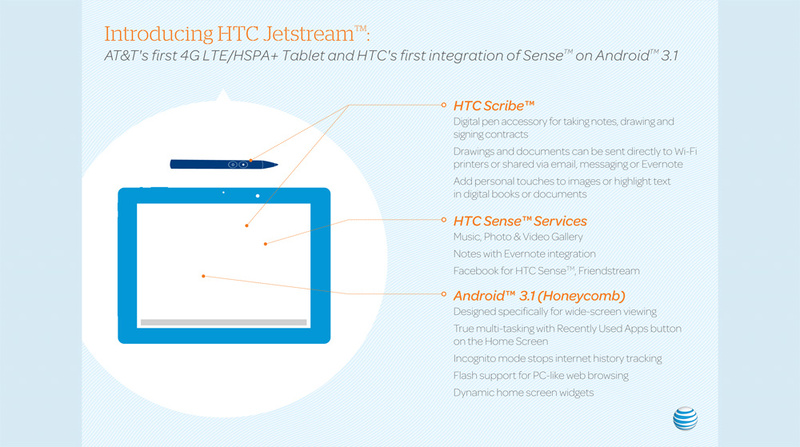 There are quite a few firsts going on with the HTC Jetstream. 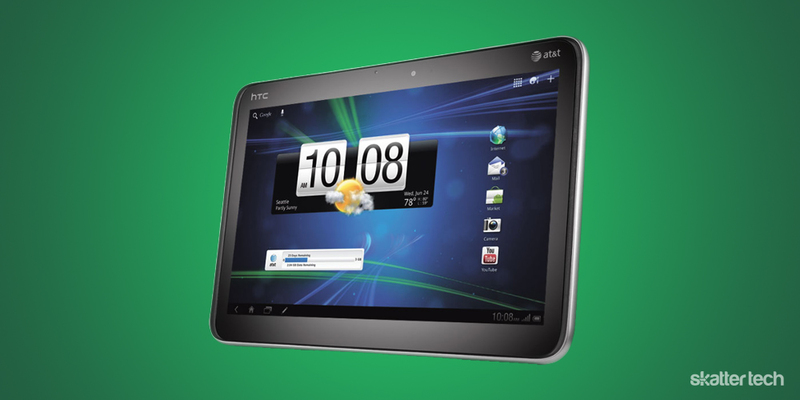 It is the first tablet from HTC people actually care about, the first tablet to ship with Android 3.1 Honeycomb, and AT&T’s first 4G/LTE tablet. The HTC Jetstream features a 10.1-inch display with a 1280 x 800 WXGA resolution. A dual-core 1.5 GHz Snapdragon processor is inside. Along with 4G network speeds, you have a blazing fast device. The tablet supports the latest version of Adobe Flash Player for those that need it. The 8 megapixel rear-facing camera supports 1080p HD video capture. A 1.3 megapixel front-facing camera is built-in and it should work with the included Google Talk app for video calls. The 7,300 mAh battery should keep the tablet running for plenty of time. Unlike the Galaxy Tab 10.1, the Jetstream supports microSD expansion up to 32 GB. HTC is still pushing their pen-input technology too, as the Jetstream is fully compatible with the HTC Scribe — though it’s sold separately. HTC Sense UI for tablets will enable pen-input capabilities since the technology is not native to Android out of the box. There is also syncing support with Evernote for handwritten notes. This is the company’s first real push into the tablet market. Sure, they released the WiFi-only Flyer and the Sprint-branded Evo View 4G, but these only had 7 inch displays and ran on Android 2.x which is an operating system optimized for smart phones, not tablets. HTC appears to have a solid product with the Jetstream, but now the company has to convince consumers it is worthy. Unfortunately, they are not off to a good start. The Jetstream will be available exclusively on AT&T starting September 4th for $699.99 on a two-year contract. Not only does that make this tablet $200 more expensive than the industry standard, but a contract with AT&T means customers will have to pay a monthly data fee. AT&T’s pricing options are $15 for 200 MB per month, $25 for 2 GB, and a new $35 for 3 GB. The latter might make you shed some tears. And while I am on the subject of AT&T, I should note that they have yet to deploy 4G LTE in any city. The carrier originally planned to launch in five cities this summer. Competitors such as Verizon Wireless are already offering 4G LTE to nearly a third of the country. There is no WiFi option just yet, but hopefully we will see one in the future. Until then, you and your wallet suffer. We will definitely get our hands on a unit for review, so stay tuned for that too.